Why did Subaru choose XV Crosstrek over Forester for new hybrid? Subaru announced the new XV Crosstrek will be their first-ever production hybrid model. Why did Subaru choose the XV Crosstrek and not the 2014 Forester to be their first hybrid? We reported here in January that Subaru would introduce their first hybrid model at the New York International Auto show, and it was no surprise this week when Subaru made the announcemnent. But it was a bit of a surprise that Subaru chose the newly developed XV Crosstrek as their first-ever hybrid model. Many thought that Subaru would use the new 2014 Forester or the newly designed Impreza that is already the most fuel-efficient all-wheel-drive in their lineup at 36 mpg. So why did Subaru decide to bring out their first hybrid in the new XV Crosstrek? Subaru has a very loyal following of buyers who have been keeping their vehicles in the family for years. But Subaru knows that if they are to grow market share, they will need to attract a new generation of buyers who have never looked at the brand before. 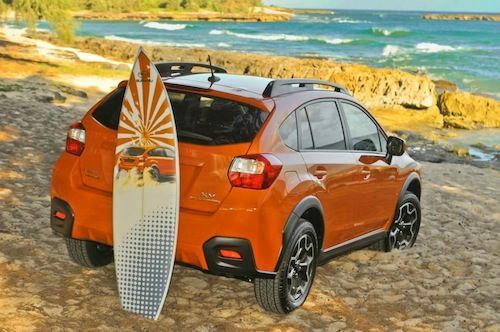 If you look at Subaru’s picture above with a surfboard, you can see who they are appealing to with the new XV Crosstrek hybrid. And Subaru knows that the Forester has been appealing to an older more seasoned buyer who has purchased the crossover for years. They will likely get more global hybrid sales from the XV Crosstrek than the new 2014 Forester. All of Subaru’s marketing of the XV Crossover has been to a younger generation of buyers who have an active lifestyle. The all-new XV Crosstrek hybrid is much more likely to appeal to this generation than the generation who is going to buy the new 2014 Forester. The XV Crosstrek buyers are looking for both function for weekend trips to the mountains or beach and the fuel-efficiency that goes with it. Subaru also needs to compete around the globe with Toyota, Honda and Nissan and will feature a new gas-electric XV Crosstrek hybrid vehicle to keep the sales momentum going. Subaru has been tight-lipped about the new XV Crosstrek hybrid, but we can get an idea of what might power the hybrid with a powertrain similar to the Advanced Tourer Concept that made its debut at the 2011 Tokyo Motor Salon. The hybrid show-car was powered by a 2.0-liter turbocharged inline-four engine paired with an electric motor producing just 13 horsepower of assist. Energy was stored in a small lithium-ion battery pack recharged by regeneration during braking and coasting. Will the all-new Subaru XV Crosstrek be Subaru’s only hybrid? It’s likely that the Japanese automaker will feature more than one hybrid vehicle. Just take a look at the VIZIV Concept that Subaru unveiled in Geneva and we can get a look at their future plans. Subaru has developed a new hybrid system that will be coupled with their already fuel-efficient diesel. The hybrid diesel powertrain is a plug-in hybrid system that combines a 2.0-liter Subaru Boxer diesel engine and the new high-torque-compatible Lineartronic (CVT) with a front motor that provides both vehicle drive and power generation, and two independent rear motors for vehicle drive only. Toyota has hinted that a hybrid powertrain may be offered in the future for the Toyota GT 86, Scion FR-S and that would include the Subaru BRZ. Subaru already sells the diesel around the globe and the new diesel hybrid powertrain would work well in a number of other Subaru vehicles. Has Subaru forgotten the U.S. market? It’s likely Subaru will introduce the first diesel in the North American market coupled with the hybrid technology. The U.S. is their largest market and they will be looking to attract a new generation of buyers with the new XV Crosstrek hybrid and a new diesel hybrid option in the future.